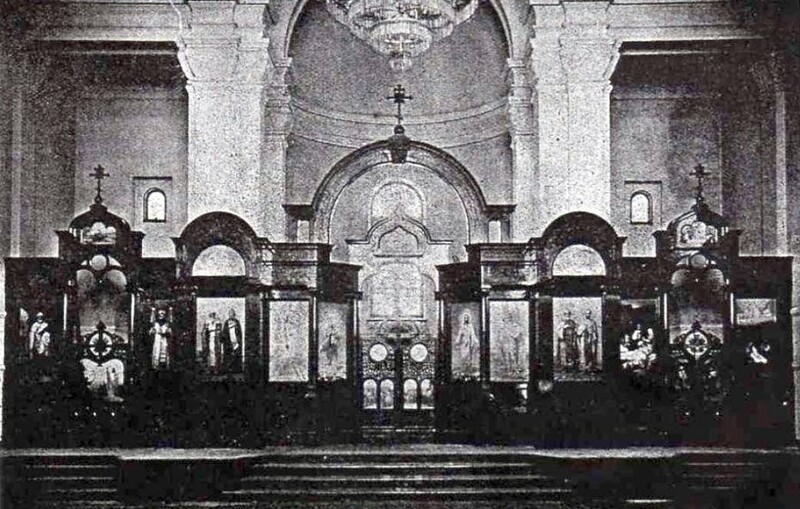 Interior of St. Nicholas Russian Orthodox Cathedral in New York City, as it looked in the early 1900s. Prayers Offered for Czar at Cathedral of St. Nicholas. Christmas was celebrated in New York yesterday by ten thousand Russians, Greeks and Syrians, in accordance with the Julian calendar, which is thirteen days later than the Gregorian calendar. The observation of the day was almost purely religious, and services were held in two Orthodox Greek churches and two Greek Catholic churches in Manhattan. As there are no seats in the Greek orthodox churches, one thousand Russians stood for two hours in the Cathedral of St. Nicholas, in East 97th street, while the liturgy was chanted and a sermon delivered by the pastor, the Rev. A. Hotovitsky. The service closed with a prayer for the safety of Nicholas II, Czar of Russia. For those who attended these services and those at the branch of the Cathedral at No. 347 East 14th street, where the pastor is the Rev. Peter J. Popoff, the day ended six weeks of fasting. The home celebrations, which began after the services, consisted of elaborate feasts. Among those who attended the branch church were twelve Russian immigrants, the members of two families, who left Ellis Island in the morning. Consequently it was their first Christmas Day in the new land. They will stay at the Russian Immigrants’ Home, which is under the charge of the Rev. Mr. Popoff, until employment is found for them. Two hundred Syrians gathered in the St. Nicholas Greek Orthodox Church, in Pacific street, Brooklyn, at midnight, to begin the observation of the day. A low and a high mass were celebrated during the morning. In the Syrian quarter business was dropped for a day of devotion and festivity. Rev. A. Hotovitsky is, of course, St. Alexander. He presided at the Russian cathedral because the archbishop, Platon, was visiting Russia at the time. I’m pretty sure St. Raphael was in Brooklyn at this point (as opposed to traveling), so he would have served at the Syrian cathedral. Oddly, especially given the title of the article (“Greek Christmas”), the Tribune makes no mention of the actual Greek churches in New York, which were also celebrating Christmas that day.